Since 1997, the lobby of the Supreme Court has hosted quarterly exhibitions of Vermont artists. 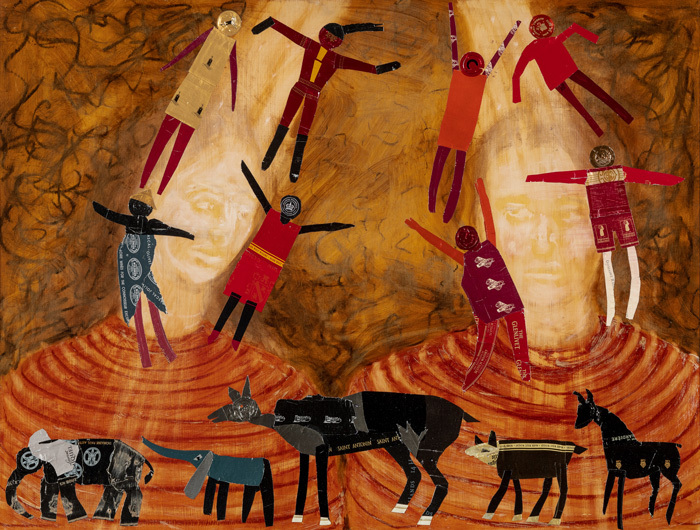 The space is curated by Associate Justice Marilyn Skoglund, who claims that having the artist’s eye has helped her become a better judge, and Statehouse Curator David Schutz, who sets the displays and works with the artists. “Vanishment” explores the fraught relationship between humans and the natural world, using, in part, materials that Van Fleet has repurposed from previous bodies of work. The backspace features a 31-foot installation called Digesting the Planet, built on an 18″ high grid of rusted steel, reminiscent of an installation the artist created in 2010 in Nagoya, Japan in conjunction with COP 10, the tenth meeting of the UN Conference of the Parties to the Convention on Biological Diversity (the United States is not a signatory to this convention). “Intestines” are made with red and brown buttons threaded on wire, interspersed with boxes in which those buttons were originally packed, stored in a basement, and immersed in a flood that left a muddy “shadow” imprint of the buttons on the interior surfaces of the boxes. Small groupings of plastic animals shelter inside these boxes. The medium here is ironic: the animals are made of what threatens them. Recent statistics paint a disastrous picture of the planet’s biome. The World Wildlife Fund’s Living Planet Report for 2018 found that the biomass (or total aggregated weight) of non-domesticated vertebrate populations has declined by 60% since the 1970’s. A study published in the proceedings of the National Academy of Sciences in June, 2018 reported that humans now account for 36% of the biomass of terrestrial mammals, and their livestock and domestic animals (mostly cows and pigs) account for 60%. All the other mammals on the surface of the planet account for only 4%. A 2016 study that collected insects in German nature reserves found that their biomass had decreased by 75% in about 27 years. This diminution of non-human life is the signature reality of the Anthropocene, which E.O. Wilson is said to call the Eremocine, or the Age of Loneliness. Diane Fitch’s solo show, “Interior/Exterior”, explores a disciplined lifetime of painting and drawing. Fitch creates a personal profile of her life and experiences, with depictions of everyday life and the private spaces within her psyche. Her fluid, textural use of paint, color, and layering geometric shapes showcases her relationship with signature subjects within pictorial narratives. She explores interior and exterior scapes that are very familiar to the artist–her homes in Vermont and Maine. Fitch captures part of a room that transitions into another part of the same room, leading the viewer into motion and experience. With strong influences from paintings of 18th and 19th century domestic interiors, Fitch moves her subject matter into modern motifs and meaning. This is a lovely collection of works that is not to be missed. Fitch is a full-time painter between Vermont and Maine, and has exhibited nationally and internationally. She is professor emeritus of painting and drawing at Wright State University in Dayton, Ohio. She also taught at the University’s summer studio abroad program in Italy, which she co-founded. The painter received her BFA from the Maine College of Art in Portland, and an MFA from Indiana University in Bloomington. Classifying herself as an abstract painter, Maria Anghelache is a native Romanian and now a Vermonter who brings forth an expressive interpretation of her work, blending abstract objects and form directly from her observation of the natural world. Her pastels and acrylic works on paper and canvas have a free-flowing, dimensional fluidity, which is especially evident in her featured series “Orchid”. In her work, she appears to both build up and break down natural elements into their constituent parts to get to the very essence of nature. An example is her ability to discern the intricate networks within living tissue. 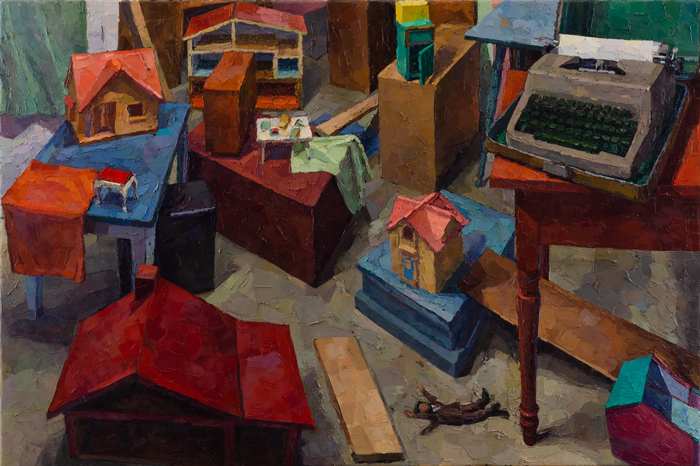 Anghelache’s observational skills were honed by her professional background at a large computer firm, echoing the interconnectedness she reveals in her work. Anghelache received her master’s degree in studio art from New York University and she also studied abroad. Her work has been exhibited internationally. 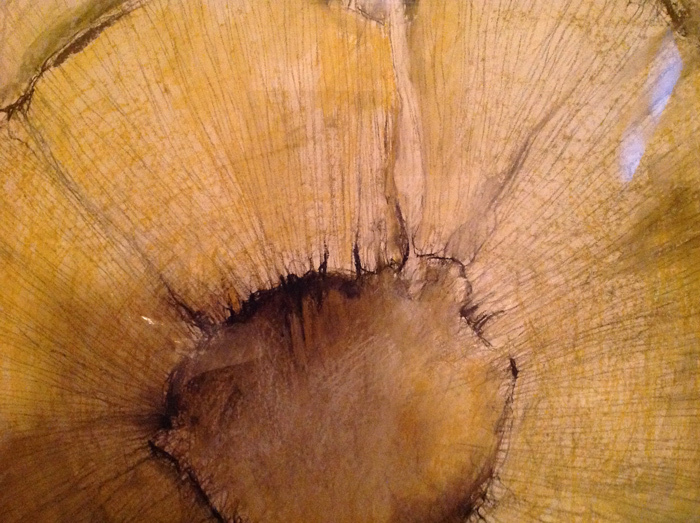 Visual artist Kathleen Kolb and poet Verandah Porche have joined forces to create a traveling exhibition called “Shedding Light on the Working Forest” based on paintings Kolb has created about this subject over the past twenty years. This project celebrates the landscape of the working forest and the voices of those who have honed skills into a livelihood there. “Shedding Light” draws on the artistic friendship of a painter and a poet who are committed to subjects that have been largely overlooked by the arts. Kathleen Kolb evokes what is solid, luminous, yet ephemeral in the scenes she gathers and painstakingly paints. She talks about how a moment of “emotional ignition” kindles a work of art. As a writing partner, Verandah Porche befriends, questions and listens, to unearth and preserve the poetry embedded in lived experience. She calls this process “finding the verse in conversation”. A contemporary realist working in oil and watercolor, Kathleen Kolb is known for her dramatic handling of light. 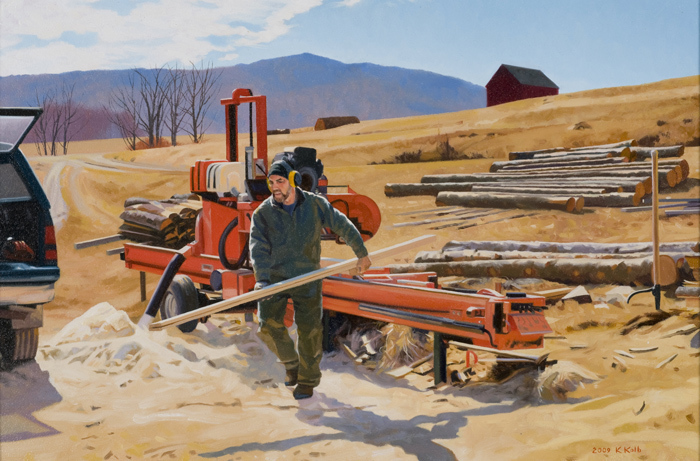 Vermont Life magazine featured an article about her paintings of the logging industry in their winter 2009-2010 issue and her work for Art of Action focused on the leading edge of the working forest in Vermont. She earned her BFA from the Rhode Island School of Design. Verandah Porche has created told poems and shared narrative with elders, factory workers, literacy students, patients, and others, during residencies across New England. She holds an honorary Doctor of Humane Letters from Marlboro College. Despite public concern about climate change and sustainability, many people are unaware of what actual work goes on in the forest surrounding them. Vital ecosystem services provided by the forest are often poorly understood. Though the public relies on the working forest, skilled labor is rarely portrayed or deeply valued. The voices of the loggers, sawyers, and others who work in the forest are absent from conversations about interdependence and care of the planet. “Shedding Light on the Working Forest” opened at the Brattleboro Museum and Art Center in October 2, 2015, where it was the centerpiece of the Windham Regional Commission’s awareness campaign on the working forest economy. The Vermont Folklife Center presented the exhibition during the winter of 2016. Since then it has traveled to sites in Maine and Connecticut. A full color catalog is available, including visual art, poems, narratives and essays by an art critic and a forestry professional. Montpelier photographer Tom Wies’ first solo exhibition, “Elusive Element”, was executed over the last four years and shot primarily from travels in Scandinavia, Serbia, Ireland, and various sites across the United States such as Zion National Park, the Four Corners, and the Grand Escalante-Staircase. Wies works primarily in black and white with some color imagery. The artist’s work encompasses landscapes, portraiture, and abstract details of the natural world. 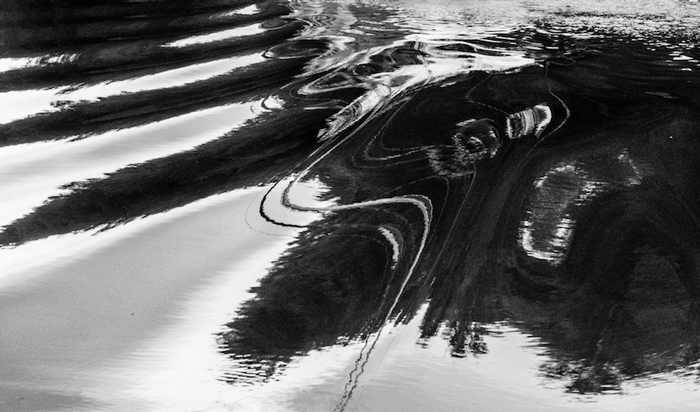 Wies is strongly influenced by the work of other photographers and painters such as Brett Weston, Alfred Stieglitz, Ansel Adams, Mary Randlett, and Eliot Porter. Tom Wies was born and raised in Connecticut but moved to East Barnard in 1978. He and his wife, Denise Johnson, now live in Montpelier. Photography has been one of his lifelong interests after a professional career as an attorney. As a self-taught photographer, Wies has actively pursued his art over the last ten years and is currently creating a new series exploring Vermont’s farms and the working landscape. Arthur Schaller’s works at the Vermont Supreme Court are collages assembled on board of cut or ripped pieces of printed matter from assorted publications, inspired by ships that have created a metaphorical narrative in all aspects of his life.